Election campaign tips - 6 useful principles. This is a positive campaign is to raise awareness of the option to Vote NONE as a protest vote, especially for people who will otherwise stay silent. We're publicising this site widely. But only you can make it happen in your area and network. Please display a poster in your window, on your car, and in your workplace, club or local noticeboard. They are non party-political - they just encourage people to do something. Please distribute the election leaflet where you can, especially where people may then talk about it. Enjoy conversations with voters and non-voters. You're not telling people who to vote for, just encouraging them to do something. Let's share our experiences with #VoteOrVoteNone. The challenge of a campaign may seem huge, but it is exactly what every independent candidate faces in this election. One in every three people around you didn't vote. So they are not difficult to find! If each of us just inspires some non-voters to vote or vote NONE, then there is the potential for progress. We're more likely to change our minds from discussions with people who we like and respect. So be honest and be yourself. Enjoy the discussions. You don't have to know all the answers. Just start discussing the issues and working out the answers together. Our experience of talking on doorsteps with people who are angry and determined not to vote, is that they are interested in the idea of a protest vote, and we end up having a positive conversation. But if not, just move on. If you blog, or have a Facebook or Twitter account, or other social network, consider using it. Be honest. Say what you think. Say what's happening, and what's interesting or difficult. That will interest and inspire others. Use the Twitter hashtag #VoteOrVoteNone to share thoughts and experience. Talk with family, friends, neighbours and colleagues, especially the 'Unheard Third' who are thinking of not voting. Why stay silent? If what other people think and say genuinely interests you, and you enjoy the challenge of convincing someone of something, then you have the basis for a respectful and potentially enjoyable conversation rather than a sales pitch. Equip yourself with some leaflets and deliver them. Be open to unpredictable and interesting conversations. Stay safe: do it as a pair. A recent survey showed that many young people were not clear how to vote, as well as who to vote for. So for them, and people who have moved house in the last 18 months, ask if they are registered to vote, and point them to the government website on the leaflet. If they are interested in voting NONE, look at the leaflet with them to see what it means and what it could achieve. Show the image on the leaflet of how to Vote NONE, so they are confident to do it on the day. 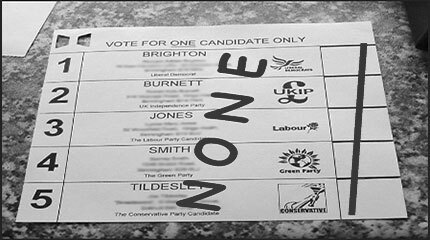 This national campaign is to raise awareness of the option to Vote NONE, not to tell people what they should do. This campaign must be better than the usual political campaigns which sneer at the other parties. If you have lost hope about UK politics, you must respect others who have hope. They may have reasons, and they may be right. You do not know what a particular candidate could achieve, or not achieve. In a free democracy, that is for the voters to judge and for us to respect. It is a right wing agenda to neutralise politics, so don't do it yourself. To claim the politicians 'are all the same' is as simplistic and offensive as it is when it is applied to any other group in society. It is an end to thinking. Any improvement in UK democratic politics has to be achieved by democratic politics (see What it achieves). So it is absolutely consistent to advocate NONE as a visible protest vote, while also hoping that people will one day find and support a candidate who deserves their vote. Winning support in elections takes work and time. Women fought for years to get the vote, and many were imprisoned and some died. So don't expect or promise a huge protest vote in a single election. As in sport, it is frustrating to lose, but it's not a reason to give up. We live to achieve more next time. If people don't vote for what they believe in, or even protest by voting NONE, then we're not even on the first step. There's no need to be silent… Stay positive… These posters are party-neutral. They need to go everywhere!